These web pages cover various families mostly related to ancestors, cousins, and other relatives and friends of Sarah Elizabeth Will. The information is based on research by numerous people including research on Braffitt/Braffett families starting in the 1940s by James Matthew Braffitt Jr. All the information is subject to possible errors and incorrect assumptions as is the case for much genealogical data. Contact Don Braffitt if you have any suggested corrections or additions or if you would prefer that your name not be listed here. There are several ways to access the online genealogy information. You can go directly to the web pages by clicking here with a built-in search facility. You can also search this web site powered by FreeFind. A web search will bring up the results on this web site and many of the corresponding pages on Find A Grave. If you have an Ancestry account, a tree corresponding to the willbraffitt.org web site is uploaded into Ancestry primarily for DNA matching purposes. Most of the web pages on this site are devoted to genealogy. All the information on this web site is indexed including surnames, place names, and all source references. The Will family migrated Schreisheim, Palatinate, Germany -> York County, PA -> Shenandoah County, VA -> Meigs County, OH with P. L. Will going to Charleston, Kanawah County, WV. Other related families include Newell / Place (Chittenden County, VT -> Washington/Meigs Counties, OH), Radford /Ashworth (County Wicklow, Ireland -> Meigs County, OH), Fleak / Brookhart (Allegheny/Franklin/Bedford/York Counties, PA -> Hampshire County, VA / WV -> Wood County, VA / WV -> Meigs County, OH), Sheets (Wood County, VA / WV), Fisher (Meigs County, OH), Rice (Middlesex County, MA -> Meigs County, OH), Hecox (Warwickshire, England -> Farmington, CT -> Genesee, NY -> Meigs County, OH), Hasford (Watertown, NY -> Farmington, CT), and Rausch / Sherman (Shenandoah County, VA). Click here for more details on the Newell/Place families. Click here for more details on the Radford family. The Braffitt family migrated Orange County, NY -> Middlesex County, MA with James Matthew Braffitt Jr. going to Chamblee, DeKalb County, GA during World War II. Other related families include Mosher (Kings County, Nova Scotia -> Middlesex County, MA), Giles (Ireland -> Cumberland County, Nova Scotia), Willis (Scotland -> Cumberland County, Nova Scotia), Henney (Cumberland County, Nova Scotia), Huston (Kings County, Nova Scotia), Gilmore (County Antrim, Ireland -> Orange County, NY), Newbury (Ireland -> Orange County, NY), Mapes (Long Island, NY -> Rockland County, NY -> Orange County, NY), Rumsey / Rose (Long Island, NY -> Orange County, NY), and Douglass (Ireland). Additional information is included on several additional Braffett / Braffet family lines. The James Braffett / Rebecca Gore family and descendants migrated Windhan County, CT -> Luzerne/Bradford County, PA -> Darke/Preble Counties, OH -> Grant County, IN -> Mercer County, MO and on to TX, OK, AZ, and CA. Other related families include Long, Jaqua, and Wood. The James Braffet / Melissa A. Furman family and descendants migrated Orange County, NY -> Lee/DeKalb Counties, IL -> Carbon County, UT -> CA. The James William Braffet / Lucretia King family and descendants migrated Ulster/Sullivan Counties, NY -> Pike County, PA -> Pottawattamie County, IA -> Juab/Levan/Utah Counties, UT -> Bonneville County, ID. Click here for more details on the Braffett/Braffet/Braffitt families. 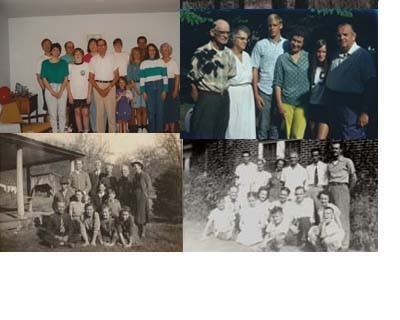 The Johnson family migrated Wilkes County, NC -> Grayson County, VA with Doris Will going to Charleston, Kanawah County, WV where she met and married P. L. Will in 1949. Other families include Hash / Grubb / Haga / Osborne (Grayson County, VA), Ward (Henrico County, VA -> Grayson County, VA), Halsey (Columbia County, NJ -> Alleghany County, NC -> Grayson County, VA), Cobb (Plymouth County, MA -> Taunton, Bristol County, MA -> Morris County, NJ -> Grayson County, VA), Delp (Germany -> Bucks County, PA -> Rowan County, NC -> Grayson County, VA), and Porter / Byrd / McCrary (King and Queen County, VA -> Wilkes County, NC). Nathan Ward married Sara, possibly a Cherokee Indian, from Turkey Knob, Alleghany County, NC. The Cook family migrated Union County, GA -> Cherokee County, GA -> Milton/Fulton County, GA -> DeKalb County, GA where Dorothy Nadine Cook met and married James Matthew Braffitt Jr. in 1944. Other families include Blackwell (Surry, NC -> Spartanburg, SC -> Lumpkin County, GA -> Hall County, GA -> Cherokee County, GA -> Fulton County, GA -> DeKalb County, GA), Rives (Oxfordshire, England -> Prince George County, VA -> Chatham County, NC -> Hall County, GA), Goode (Cornwall, England -> Whitby, VA -> Henrico County, VA -> Hall County, GA, Bell / Lasseter (Cobb County, GA -> Fulton County, GA), Glaze (Spartanburg, SC), Crumley (Yorkshire, England -> Frederick County, VA -> Newberry County, SC -> Habersham County, GA -> Union, GA), Gilkey (Perth, Scotland -> Frederick County, VA), Plunkett / Murdock / Cleland (Ireland -> Newberry County, SC), Fain (France -> England -> Union County, GA), Wild (St. Gallen, Switzerland -> PA -> Burke County, NC -> Macon County, GA -> Union County, GA -> Cherokee County, GA), Bird (Prince George's County, MD -> Rowan County, NC -> Burke County, NC -> Macon County, NC), and Banning (England -> Talbot County, MD -> Washington County, VA -> Burke County, NC). Click here for more details on the Bird family. Click here for the will of John Wild of Macon County, NC.